You don't get a lot of extra features, but this player delivers excellent performance on both the video and audio fronts. It’s not a gaming console, so you’d expect Samsung’s UBD-K8500 to have a sharper focus on Ultra HD Blu-ray disc playback, online media streaming, and media-file playback than Microsoft’s Xbox One S. It does. It loads discs quickly and smoothly; its Java-based user interface is easy to navigate (and you don’t need to install anything to connect to services such as Netflix and Amazon Instant Video), and it plays lots of multimedia file formats from USB media. The minimalist design of the UBD-K8500's remote control makes it super easy to use, though fast-forward and rewind buttons would be welcome additions. Sparse isn’t always the same thing as efficient. In the end, the UBD-K8500's playback proved every bit as good as that of the Xbox One S and the Panasonic DMP-UB900, with smooth panning and action shots. But we did encounter a handshake issue with Sony’s X930D TV. We eventually fixed the problem using motion compensation settings, but only after a lot of digging into settings on both the player and the TV. The UBS-K8500 was otherwise rock-solid; that is, it played every disc properly, every time. Color was great if slightly cool in temperature (you’ll need to enable 10-bit color on your TV if it doesn’t automatically recognize requests), and the HDR effect was beguiling. 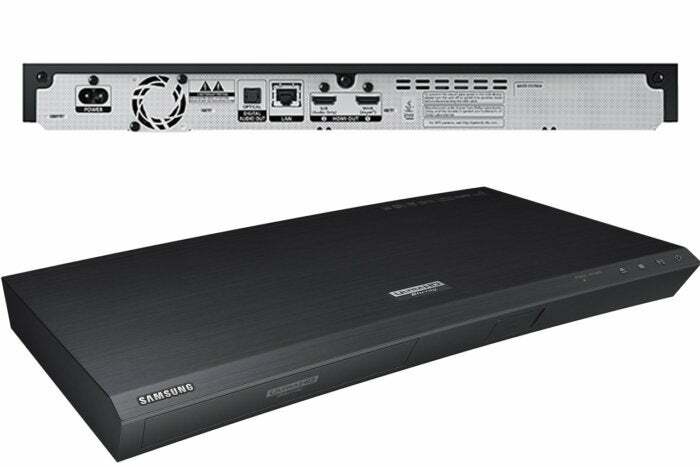 Samsung's UBD-K8500 Ultra HD Blu-ray player offers a limited number of I/O ports: HDMI, HDMI audio, S/PDIF audio, USB (front only), and ethernet. Samsung’s player is equally strong at playing media files from a USB drive. It played all our h.264 (AVC) and h.265 (HEVC) 2160p test videos, and the majority of our older format test files, except for older QuickTime movies. It was also excellent with audio, playing the APE and OGG files that the Xbox One S couldn’t handle, in addition to Apple M4A, Apple Lossless, FLAC, MP3, and all types of WAV files. The only format it couldn’t handle was Windows Lossless. Online streaming was also silky smooth over our company T3 line. The only area where the UBD-K8500 fell a tad short was displaying images. It understood JPEG, BMP, and PNG, but not the GIF or TIFF files that the Xbox One S understood. That’s still better than the Panasonic DMP-B900, which only understood JPEG and JPEG 3D files. The Samsung UBD-K8500's curved form factor make it a good match for its line of curved 4K UHD TVs, including the wonderful KS9800. In terms of apps, the UBD-K8500 offers everything that you will find on Samsung’s smart TVs, including Netflix, YouTube, Hulu, and so on. The unit will also play back any file type it understands when doled out by a DLNA server. If you’re rocking a NAS box for streaming and home backup, that’s a definite plus. 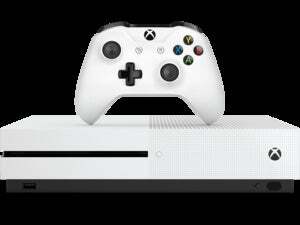 Thankfully, and possibly in response to the appearance of the Xbox One S, the UBD-K8500’s street price has plummeted to $250, which is $150 cheaper than what we bought it for a couple of months ago, and $50 less than the least-expensive Xbox One S. And the UBD-K8500 can stream advanced high-definition audio codecs such as Dolby True HD, DTS HD Master Audio, and Dolby Atmos that the Xbox can't. 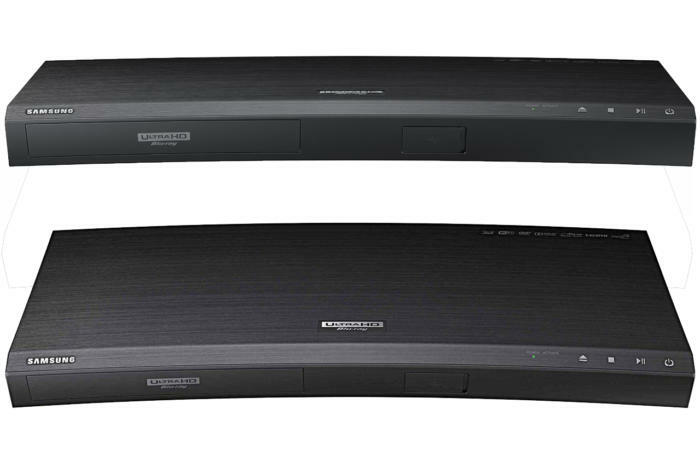 Finally, it’s a whopping $500 less than Panasonic’s feature-rich, but somewhat hard-to-find DMP-UB900.